Wildfires across the U.S. are blazing bigger and hotter than ever in recorded history. How can Mountain West communities prepare for the inevitability of a future with more fires? Three backcountry skiers glide quickly across untouched snow, the chorus of their climbing skins scratching along in unison. Up in front, professional ski mountaineer Teague Holmes pulls out his iPhone. He moves up the mellow slope in a linear formation with his backcountry ski partners Jason Kilgore and Chris Baldwin, and begins to film. As I watch their morning ski via Instagram, I’m most captivated by the striking canvas. A grid of obsidian-coated pines stands abruptly against the white snow—a forest left charred and branch-less after the 2018 Buffalo Mountain Fire, an incident that started just two miles west of Silverthorne, Colorado. Holmes knows this terrain all too well. Aside from his ski-video skills, he is a professional arborist with a focus in wildfire mitigation. Two decades ago, he graduated with a degree in Wilderness Recreation Leadership and Environmental Education and moved to Breckenridge. After dabbling in carpentry and painting, he launched TSH Tree Service, a full-service, low-impact tree removal company that’s now 14 years old. Residents and recreationists of the West walk a fine line with wildfires, but there are some steps they can take that can make a difference. To do that, they need to better understand the process of wildfires, as well as climate change and continuing human encroachment, which are making them worse. We talked with Teague and other wildfire experts to determine how we can learn to endure and make the best of a world where wildfire is a sad inevitability. Burned areas are taking over the Mountain West. Back in the 1990s, an average of 78,600 wildfires occurred annually in the U.S.. After the new millennium, the number of wildfires across the country dipped to 73,200 per year. Yet the average amount of land burned by those fires doubled to 6.9 million acres. In 2017, we saw that paradigm persist: Fewer wildfires swept over the nation—a total of 71,500—but that year, 10 million acres burned, the the second-highest figure on record, according to the 2018 Wildfire Statistics report issued by Congressional Research Service. With more and more people building closer to public lands and seeking outdoor recreation, the ripple effects of big fires continue to intensify. “A huge part of my world is managing the wildfire versus suburban-urban interface, and trying to help people balance their goals and needs,” Holmes says. His work entails defensible space consultation and hazard fuel reduction with the aim of “helping clients manage their properties and values in a wild mountain environment, reducing wildfire danger, and maintaining that forest—what they moved there for in the first place,” he explains. By the time Holmes started his business, the mountain pine beetle epidemic had produced a tremendous number of standing dead trees in the West. Municipalities, private land-owners, forest-based outfitters and tree service companies like TSH met a huge demand to remove the beetle-killed forest in their region of north-central Colorado. The work paid off: For instance, the fuel breaks that were put in place after the beetle-kill outbreak prevented the 2018 Buffalo Fire from infiltrating Silverthorne’s Wildernest and Mesa Cortina neighborhoods. “My approach to wildfire management focuses on accepting a certain level of risk of living with a wildland-urban interface. I try to provide education about wildfire protection while not steering people to take down more trees than they intend to,” Holmes says. Fuel reduction, including the removal of select trees, is a significant method for mitigating fire risk across the Centennial State. Close to 70 wildfire sightings per year are noted in Summit County alone, according to Holmes. Last year, 5,730 reported fire incidents transpired statewide followed by a subsequent financial loss of $46.2 million, according to the state’s most recent fire data, published September 2018. 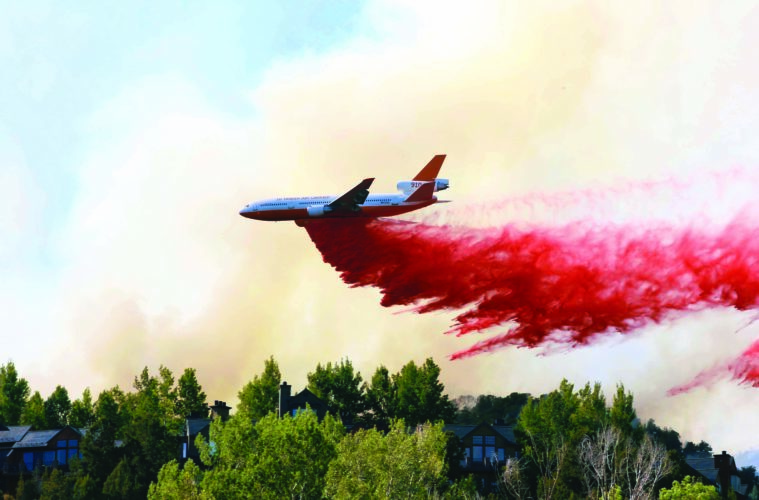 Nationwide, 53 large wildfires burned by mid-summer including the Spring Creek Fire, which consumed more than 107,000 acres and was the second single-largest fire in Colorado’s history. The greatest public health concern is the fine particulate matter of wildfire smoke, Landes explains. This type of inhalable pollution is at least 30 times smaller than the average diameter of human hair, according to the U.S. Environmental Protection Agency. “Many Coloradans like to spend time outside doing outdoor activities…and fine particulates are not visible to the naked eye,” says Landes. During a wildfire smoke episode, the safest time to go outside and exercise is during the afternoon, which is counterintuitive to an alpine start that helps adventurers avoid afternoon thunderstorms or increased avalanche danger in the Rocky Mountains. “By afternoon, the atmosphere heats up, and smoke isn’t as concentrated near the earth’s surface. The worst time to go outside is during the early morning, right after sunrise, when an inversion is in place. Air, including smoke, is trapped and dense near the ground level,” explains Landes. He also provides a few guidelines: Visible smoke indicates that there’s a high concentration of particles in the atmosphere. If you can still see landmarks that are 5 miles away, then you can assume it’s safe to continue with your normal outdoor activity. Locals can also follow real-time air quality metrics, which are collected via monitor sites scattered around the state, online at colorado.gov/airquality. Ozone pollution is also exacerbated by wildfire smoke. “Ozone is a very complex issue with many ingredients, and it surfaces near areas with high car emissions, power plants, factories, refineries, etc.,” says Landes. Colorado’s ozone mostly appears on the Front Range in Denver, Boulder, and Fort Collins, whereas, the state’s rural areas are only impacted by the fine particulates of wildfire smoke. Regardless of location, if the air quality is poor, try to exercise or practice your outdoor hobbies inside, like at a local climbing gym or cycling studio. Choose a facility that recirculates the air, rather than one that pulls contaminated air in from outside. Keep windows and doors closed. And visit a health care specialist if you suffer from any symptoms of a respiratory illness. It’s also essential to stay in tune with the local or national policies that influence wildfire management or climate change. Global warming is one of the driving factors of wildfire growth, says Michael Kodas, a wildfire expert and the deputy director at the center for environmental journalism at the University of Colorado. Last spring, congress voted to add a $2 billion budget that will support the U.S. Forest Service’s wildfire response, starting in 2020. The bill was backed due to public advocacy including the support of outdoor industry brands and the Outdoor Industry Association, says Erin Gaines, advocacy manager of KEEN. “The wildfire funding fix was successful because people made calls and sent emails saying why and how this issue impacts us: [Wildfires] impact employees, recreationists, outdoors people, local communities, and economies. It can’t be overstated how important it is to make your voice heard,” Gaines says. Past the red tape, in order for wildfire management to be most effective, the public’s negative connotations of wildfire need to shift. Today, the federal government spends $3 billion per year fighting fires, compared to $300 million spent annually in the ‘90s, says Kodas. In 2017, the professor published his latest book, Megafire: The Race to Extinguish a Deadly Epidemic of Flame, which dissects the complicated web of economic, social, cultural, and political variables of wildfires worldwide. Kodas even joined a state-operated firefighting crew, in 2002, in order to understand wildfires from the front lines. Then he traveled and observed devastating wildfires all over the globe. “In most countries, the public responds to wildfire as if it’s a natural disaster. In reality, fire is a natural process for forests. Most landscapes in the world need wildfire to be healthy. We’re going to have to quit a zero-tolerance policy toward wildfires,” says Kodas, who concludes that a militaristic approach exacerbates wildfires. In the near future, the U.S. won’t have enough resources to fight all fires. Forest Service scientists estimate that number of acres that will burn each year will double by mid-century, according to the U.S. Department of Agriculture. And the duration of the wildfire season—which has been extended by climate change—is now 80 days longer than in 1970. “We’ll need to focus on [fighting] the fires near our values: homes, watersheds, and infrastructures. Natural fires that are away from our most imperative resources? We’re going to have to let those burn,” says Kodas. As outdoor adventurers navigate singed ecosystems, we need to consider the full picture. Burns are ultimately a causeway to healthier forests. Fire removes low-growth underbrush, forest floor debris, invasive species, and pests; it nourishes soil; and it enables sunlight to reach a woodland’s interior. The ecological effects of a wildfire—such as the increased sediment or nutrient levels in streams—are often severe yet short-lived, according to University of Idaho research. Furthermore, a diverse forest is a healthy forest, says Holmes. Monoculture species thrive due to wildfire suppression. A burned area has incredible new opportunity for heterogenous growth. Organic thinning of a forest can even enhance recreation opportunities—especially ski touring, as evidenced by Holmes as well as the 2018 documentary, The Fire That Saved Sun Valley. Beyond the science and politics, a blackened landscape embodies an unspoken enchantment. Holmes tells me about a special old burn area on Spanish Fork Peak, in Utah: “When the snow reaches all the way to valley floor, it’s one of the most incredible ski runs. As you ski through the old trees knowing that the fire did what it was supposed to do for that landscape, you feel really connected to nature. It’s dark and sad for the loss of life. But it’s exciting, beautiful and magical, because it gives new life to the forest.” The complete life cycle is amazing to witness.